Is There a “Best” Way to Watch Anime? Any public form of entertainment has its own set of rules for the audience to follow. Go to a movie theater and you’ll be expected to shut off your phone (yes, including YOU, guy in the front row) and keep quiet during the film. Go to a sports event, on the other hand, and you’ll be encouraged to scream until your lungs collapse in order to distract and intimidate the opposing team. Audience etiquette helps set the mood for an event, and contributes to what is hopefully an ideal viewing experience. With that in mind, is there a “perfect” setting and code of conduct when it comes to watching anime? This is a question that’s been floating around in the back of my mind since overhearing an interesting conversation at this year’s Anime Expo. As I camped out in a relatively quiet hallway between panels, two first-time attendees were discussing a screening they’d just been to. One of them remarked on how involved the audience was in the experience, reacting loudly and frequently to the events on screen. It was, he pointed out, a far cry from watching anime late at night, keeping the volume low out of courtesy for his sleeping roommates. I wandered off before he was able to decide if one was more enjoyable than the other, so I suppose it’s up to me to draw a conclusion. This one’s for you, Skinny Guy In Cargo Shorts. Like any form of storytelling, an anime series will seek to immerse the audience in its world, briefly transporting them away from their everyday lives. Its settings become real places, populated by real people with real emotions. If the show is successful, the audience will react to fictional events as though they’re actually happening. The better the illusion, the more we care about the characters. To that end, the ideal viewing environment is one that helps the viewer dive headfirst into another world. In this respect, watching with other people has the potential to help or hurt the experience. On one hand, having someone else follow you down the proverbial rabbit hole can make the illusion seem more real. Your mutual desire to see the heroes escape a dangerous situation unscathed heightens the tension in the room, allowing you to feed on one another’s enthusiasm. If you’ve ever watched a sport you’ve never seen before with people who follow it passionately, you’re probably familiar with this effect. 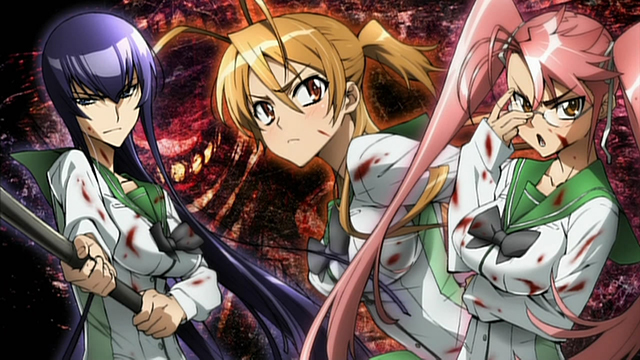 The first time I watched High School of the Dead was at a convention screening, and the audience’s enthusiastic response to particularly cheesy one-liners or gruesome zombie kills made the show far more entertaining than it had any right to be. If you’re watching this series alone and sober, you’re absolutely doing it wrong. On the other hand, being part of an audience can just as easily pull a viewer out of a show’s fictional world. Something as simple as checking a cell phone or striking up a side conversation can shatter the wall holding back the floodwaters of reality. A distracting audience won’t stop a good anime series from being good, but it can hinder the viewer’s ability to fully enjoy the experience. Of course, most of this applies to just about anything that comes out of the magic box we call television. Whether it’s Game of Thrones or Attack on Titan, watching with the right people can make a big difference. But are there any qualities unique to anime? For one thing, having someone who’s familiar with the medium sitting nearby can be a big help if you’re only just getting started. I was the first person among my friends to discover anime, which meant I spent a lot of time scratching my head over obscure references and cultural nuances. For instance, when a harem comedy spoofs Neon Genesis Evangelion, it’s awfully hard to understand the joke when you haven’t freakin’ watched Evangelion yet and don’t know anyone who has. More so than with television that comes out of our home country and culture, an anime viewer can benefit from a ready and eloquent source of information. 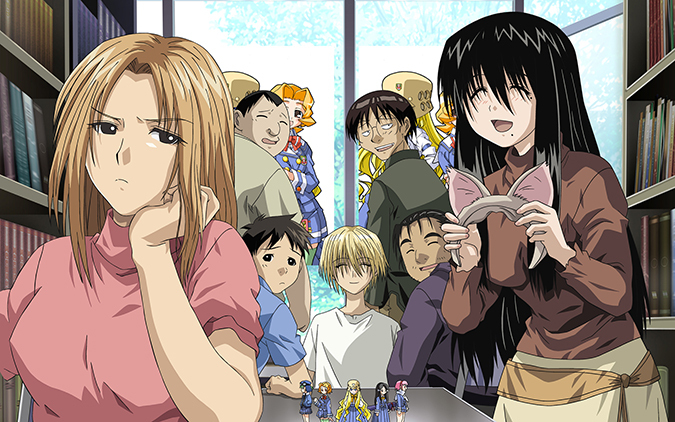 Just try not to be the only “normal” person in a room full of full-fledged otaku. Some anime genres can also be more obvious about their intended viewing environment than their western counterparts. Slice of life shows like Aria and Non Non Biyori depend heavily on audience immersion in order to be enjoyable. If the series’ atmosphere can’t transport a viewer to its fictional setting, much of the appeal is lost. 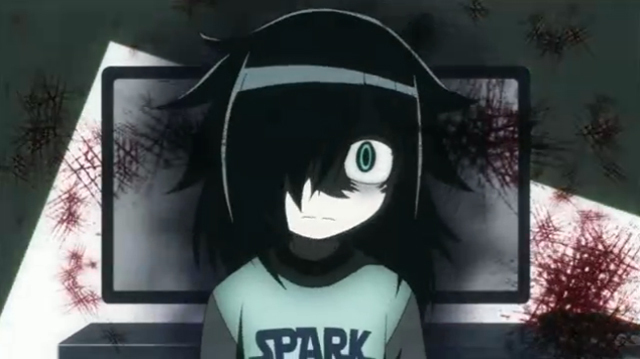 I’ve found it unusually difficult to watch anything particularly slice of life-ish unless I’m able to do so alone. On the opposite end of the spectrum, some of the more high-energy comedies almost beg for a rowdy, wisecracking audience. The most fun I ever had with Cromartie High School was playing a drinking game which stipulated that if the show made a joke and no one could explain it, everyone had to drink. In the interest of not giving my limited readership alcohol poisoning, I should probably discourage you from ever playing this game, but you get the idea. Screaming, “What the hell just happened?” is more fun if you’re not the only one doing it. This, I think, brings us to a halfway satisfactory conclusion. One anime series can be light years apart from another in its tone and atmosphere, so I doubt there is a one-size-fits-all “perfect viewing environment.” Match the right audience with the right show, however, and you’ll make a good thing even better. How Sports Anime Finally Found a Fanbase in the US When is an Anime Parody not a Parody?